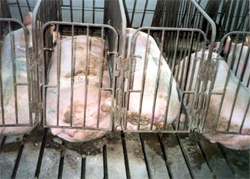 There are serious problems and concerns with our nation’s the world’s current model of how meat is put on the table – call it Confined Animal Feeding Operations (CAFOs), or Industrial Food Animal Production (IFAP) as the Pew Commission does – threatened public health, environmental degradation, severely compromised animal welfare, and decimated rural communities. Just recently, just this week, just today, we’re all getting a dose of reality about the public health angle with the discovery and emergence of the H1N1 triple-hybrid human/bird/pig flu virus. Tom Philpott raised the ire of quite a few commentors with his report on Grist of a possible link to Smithfield Food’s large hog factory (I refuse to call it a farm) in the area in Mexico near the outbreak. Naysayers were very skeptical of what they felt was a leap in logic, connecting a swine flu outbreak to a giant concentrated feeding operation, and many commenters accused the blogger of not having scientific references for any of his assertions. I don’t know what planet they’re living on. The Humane Society’s Factory Farming Campaign website provides all the solid, scientific background one could ask for (with painstaking references ) in an article by Dr. Michael Greger – it’s a good read, but look further to his online Bird Flu Book for some really in-depth education on the subject of flu, flu pandemics, and the animal connection. I’m half-way through and I can’t put it down; hell, I never knew any of this, what an eye-opener this book is (and his references are exhaustive). Short answer is: this is not new, and the culpability of industrial animal production is undeniable. I’m not surprised. You won’t be either, once you’ve taken the time to read the science of it. And it only reaffirms and strengthens my conviction to do my part as a small farmer, raising small numbers of humanely cared for, genetically diverse livestock for local consumption. I’ll do it first for myself, so that I’ll have healthy, fresh, safe food to eat; and to the extent I’m able, grow a surplus that I will sell directly to an appreciative customer. Smithfield be damned. I realize the scale of small farm production can’t meet total demand. Yet, anyway. But as Wendell says, we don’t even know what we eat, as a community, so it’s difficult to determine what it would take to feed us. We have no idea if our region can sustain itself on what can be raised reasonably in small operations that avoid the crowding and contamination that spawns disease. I say, start somewhere, and work your way out. Connect with others at the edges, link arms when it makes sense to do so, maintain your belief in the rightness of what you are doing. Feed yourself and some of your neighbors. Don’t exceed the capacity of your land and ecosystem; maintain appropriate scale. The rest will work itself out. We’ve hatched quite a mess, with our industrial, machine-like approach to producing and distributing vast quantities of animal flesh, no mistake about it. Small farms with uncrowded herds of pastured animals are surely a step in the direction of abatement, if not a total solution, to the danger. I’m steppin’ that way.